He was referring to Kelso’s first three games at the start of the 1904-05 season which was Woolwich Arsenal’s first in the top flight. However, whilst putting together our latest book – Arsenal: The Complete Record – we discovered that this wasn’t correct. And If You Think You Know Your History…. …you’ve probably been taken for a ride. The Archery Tournament – Or Was It? Now, Edwardian England may seem a long time ago, but the medieval art of archery was very much in the decline, if not virtually non-existent at this time. On top of this, £1,200 was more than one fifth of Woolwich Arsenal’s turnover at the time. To put this into perspective, it is similar to a tournament bringing in £40 million today. 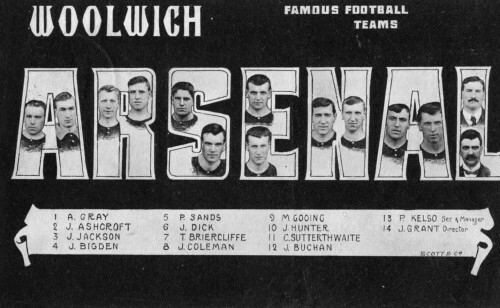 The previous season had seen Woolwich Arsenal promoted, amidst ordnance supplied fireworks and a pitch invasion, after a draw in the final home match of the season which saw the top flight guaranteed for the very first time. The pitch invasion managed to break much of the fencing surrounding the pitch, and this was the cue to allow the club to embark upon a major upgrade of the Manor Ground, in part to accommodate the extra crowd expected to witness the club in the highest league.